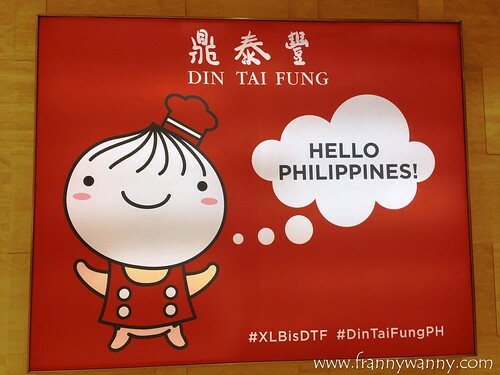 For many years, rumors have been going around town that the ever-famous Taiwanese Xiao Long Bao brand, Din Tai Fung will open a branch in the Philippines. I could still remember hearing this news back when we were still based in Manila. Well, those rumors continued to remain as..rumors for 5 years or so. No one really knew who would finally be able to bring Din Tai Fung to our food-loving shores. That was until that fateful day in December when the Moment Group made every xiao long bao-lovers dream come true. Din Tai Fung finally opened its flagship branch in SM Megamall Fashion Hall. Given that this place houses a lot of international brands such as Tim Ho Wan, St. Marc's Cafe, The Halal Guys and Ippodo to name a few, it then makes perfect sense for Din Tai Fung to join the fun mix. I was in Manila a week after it opened but hearing friends warning us about the long queues, we decided to give it some more time before we go and check it out as we really do not have the luxury of time to queue for more hours on end. So, during the Chinese New Year break, we decided to head to Din Tai Fung straight from the airport. 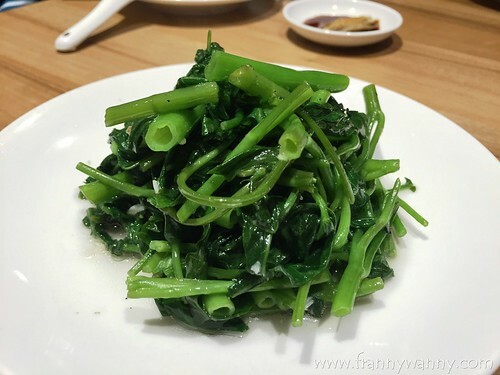 Mommy loves this refreshing starter and we always get this whenever she's dining with us at Din Tai Fung. 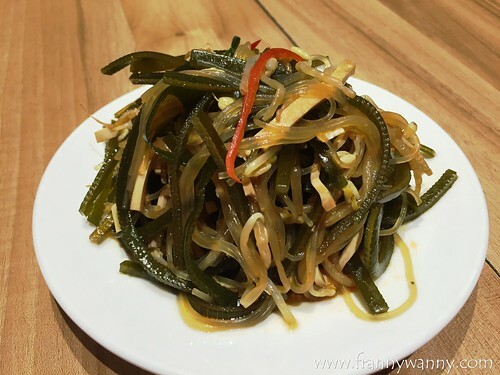 It's a delicious Chinese salad consisting of pickled seaweed, tofu strips and noodles. It's really simple but I got to admit that it's really yummy. Another family favourite. We all have varying levels of spicy tolerance but there are only two things in this world that we all agree having lots of as a family -- wasabi and hot & sour soup. Forget the fact that Papa and Pan can take the extreme heat while I would quickly scramble for water at the slightest kick of spice. However, we all love the unique combination of spicy and sour in this thick and rich soup. Even my Ninang M loves this very much that I still remembered how giddy she got upon having her a spoonful of the soup when we dined here in Singapore. Now, here's the star of the show -- Din Tai Fung's Pork Xiao Long Bao. The menu item that has been causing all these long lines not only in the Philippines but in all Din Tai Fung stores all over the world. Well, they do have one of the best xiao long baos that I've ever tasted in my life. The wrapper remains at a very consistent thickness and the soup to meat ratio was just perfect. No dry filling nor was it too soupy that you'll end up making a huge mess. 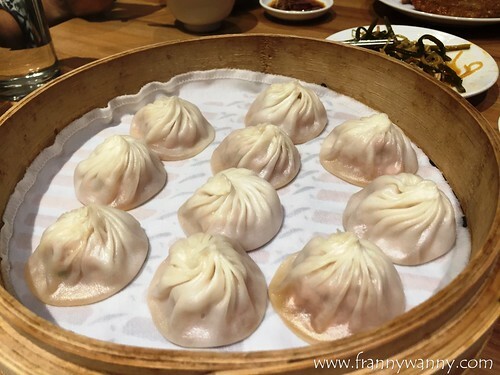 I just can't explain how I really feel about Din Tai Fung's Xiao Long Bao so let's just say, it has won my heart many years ago and it continues to do so till today. This is also Papa's favorite dish! This is Pan's favourite dish and we would also always get this in every visit. The crisp outer coating, the chunky shrimp filling and the over-all yummy flavor that will make you want more more more! It was actually so good that we quickly dove in to get a piece that I totally forgot to take a photo. Oh dear! A very simple dish but it would be good to have some veggies to balance all the flavour out. I just find this a tad too expensive though. It's amazing how Din Tai Fung's menu items are actually very simple but they're really yummy. This is just when restaurants avoided all the fancy-smanshy and continued to improve on what they're really good that. 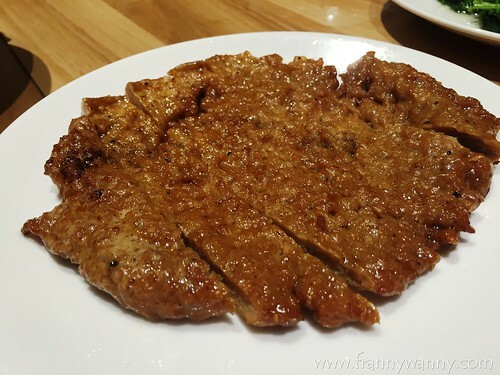 This pork chop is also a must-try and whatever happens, do not skip having this with rice. Speaking of rice, this is my personal favourite. The Shrimp Fried Rice is a delicious meal on its own. I really love how generous they are with the pieces of shrimp added in here and it's not a teeny-tiny size too. 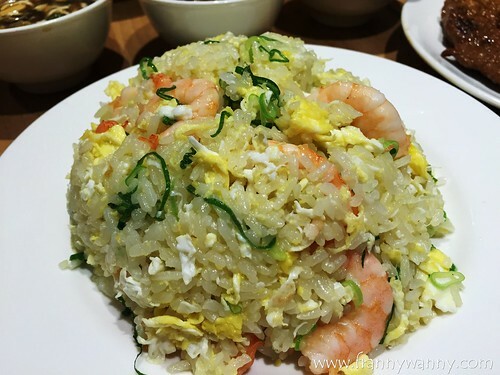 I highly recommend the Shrimp Fried Rice at Din Tai Fung. As much as I love rice, Paul, on the other hand, is a huge fan of noodles. 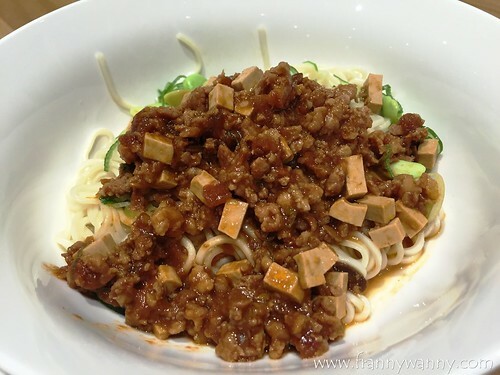 Most especially this dry kind of noodle with minced meat which we both call "Chinese Spaghetti". 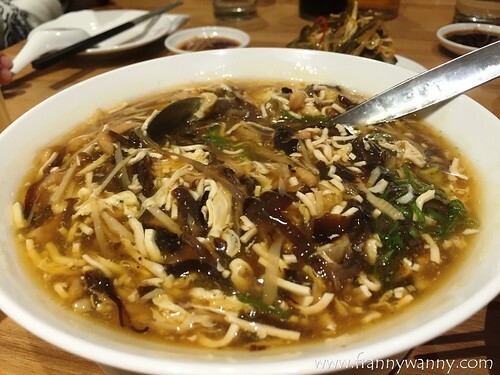 Seriously, it's like the Chinese version of Bolognese and we love how the al dente hand-pulled noodles complements the very savory minced meat with what we suspect is black bean sauce. I was afraid that we might not have enough food that night as I wasn't sure how the size of the dishes would be. So I played safe and ordered one last dish the Salt and Pepper Squid. 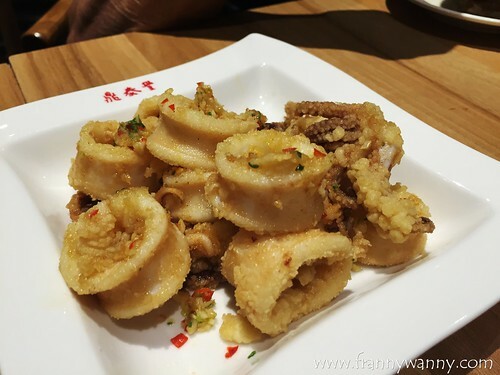 This is pretty much like a calamari only with a not-so-crunchy coating and the flavor was a bit milder than normal. It was just a-okay for me. I actually was just curious to try it as I don't recall Din Tai Fung Singapore offering this kind of dishes or any main dish for that matter. Isn't it so cool that we all got to enjoy our Din Tai Fung favorites in one meal? Actually, I failed to take note of what my brother-in-law E loved most among all the dishes that we ordered. I have to remember to ask him and we should make it a point to get that on our next visit. I'm also happy to share that Din Tai Fung's food quality was indeed very authentic. It's closely similar to the ones that I've had here in Singapore, in Hong Kong and yes, even in Taiwan. I hope that they'll add more of the classic dishes in the menu later on such as the Stir Fried Dou Miao with Garlic and Shrimps as well as the Steamed Taro Dumplings that we love so much. Price-wise, Din Tai Fung is indeed comparable to other markets. However, I think it's a bit too expensive for the local Philippine market as one meal can set you back at around Php. 500-Php. 800 per head and a lot more restaurants have price points much lower than that. Well, I may be wrong. Perhaps, Filipino are more than willing to pay a premium price for food nowadays. At least the long queue outside Din Tai Fung seems to tell me so. Will I go back to Din Tai Fung Philippines? CERTAINLY! 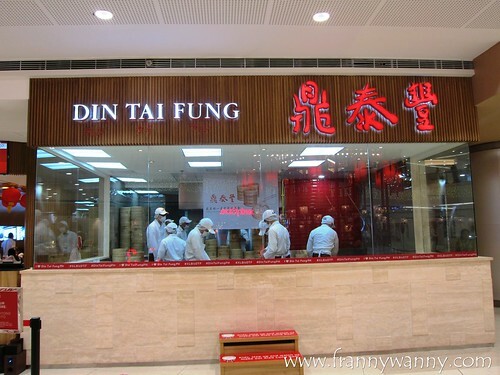 Check out Din Tai Fung at the Ground Floor, Mega Fashion Hall, SM Megamall, J. Vargas in Mandaluyong City. Call them at 997-1935. Had an issue with the Black Truffle Xiao Long Bao as it was not as fragrant as the one we had in HK or Singapore. But the rest were are as you say up to par. @bap2_s: Oh I haven't tried the Black Truffle :) I'm hoping they'd introduce more items in the coming months!